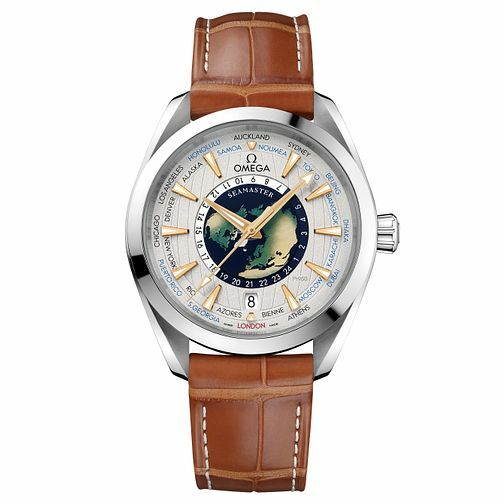 A uniquely crafted piece from Swiss watchmakers Omega sees the Earth as its main source of inspiration, with a beautiful geographic image of the world at its centre, and numerous time zones marked clearly on the dial so you can track what time it may be around the world, perfect for the frequent traveller whose need for travel is never satiated. The case material is crafted in Platinum, a material which is rarer than gold, and is renowned as one of the strongest and durable metals ever made. The nautically themed hands and indices continue the trend of the Seamaster collection, and the piece is finished with a classic brown leather strap with stitch detailing. Swiss-made with years of precision in watchmaking.